Those who have seen Talk Radio or Alpha Papa will be familiar with the set-up to Kim Byung-woo's The Terror Live. 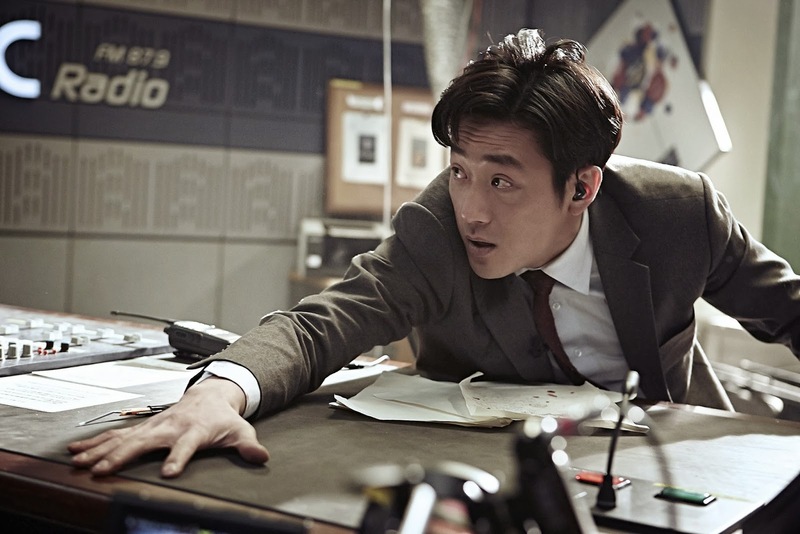 Radio presenter Yoon Young-hwa (Ha Jung-woo) has his daily routine interrupted when, in the midst of a show, he receives a prank phone call threatening an act of terrorism. Yoon brushes this off but his attention is soon grabbed by the sound of an explosion - a bomb has detonated near the studio, tearing a gigantic hole into the Mapo Bridge over the Han River. In this moment of deep national trauma, Yoon reacts in the only way a careerist journalist can imagine; the information he holds about the suspect, it is selfishly decided, would be more useful to be used in a breaking news report than it would be to the police. The terrorist calls the radio station one more time for a live interview with Yoon - he demands that the nation's president appear on air and apologise for the country's apathy towards its poor. Failing to fulfill this request, the caller warns, will result in more explosions including one which would instantly kill the presenter; his slick on-air veneer hides a terror inside Yoon as the situation spirals further and further out of his control. The bombs are evidently real but is the caller who he says he is and can Yoon trust those around him who are attempting to manage the escalating fear across Seoul? As tense a film has not been seen since the equally brutal A Hijacking (another film about the cold evils of capitalist society) and perhaps no film has ever gone so far in exploding the myths the elite peddle us. From the thin blue line through to the fourth estate, The Terror Live points it's fingers in a j'accuse of gigantic proportions. From the opening radio discussion topic of how tax cuts are there to benefit the rich, Kim's movie never lets up on how our most powerful institutions are corrupt and exist for the sole purpose of protecting the elite and the privileged. The rest of us, it would seem, we're nothing more than cannon fodder. The Terror Live is a genuinely unsettling, anti-authoritative feature, dripping in its nihlistic depiction of supposedly civilised society.